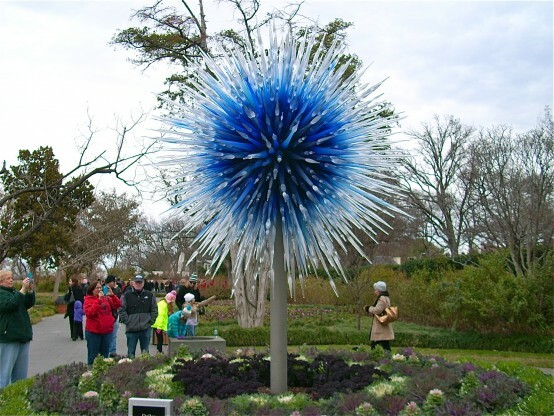 This past Sunday, we went to the Chihuly exhibit at the Dallas Arboretum. 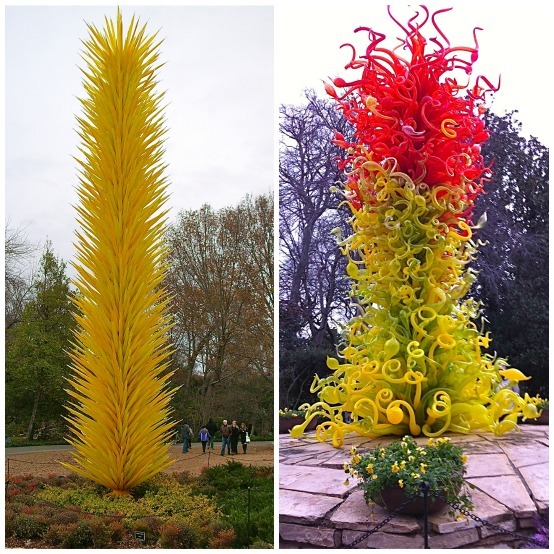 It was my mom’s birthday, and she had been wanting to go to the Chihuly exhibit ever since it first came to the Arboretum back in May. The original end date was in the first part of November, and we never did get around to going. 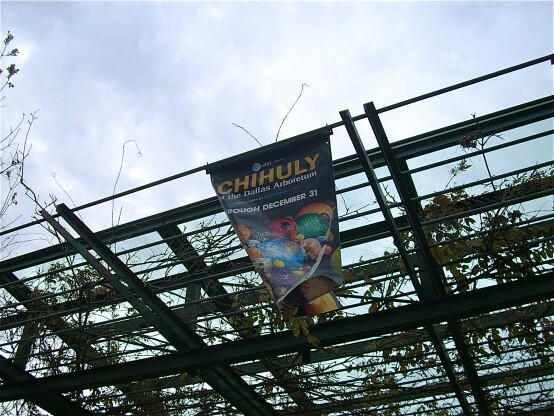 Fortunately, due to popular demand, they decided to extend the exhibit through the end of December. Yay! Our plan was to go at night when the glass sculptures are illuminated, but those tickets were all sold out when I checked on it. Bummer! The pictures I’ve seen of it at night were awesome! Anyway, there were still daytime tickets available, so once my parents got to our house, we headed down to Dallas. The temperature was supposed to be in the upper forties, but it sure didn’t feel like it. Cloudy, with no sun. It.Was.Cold. 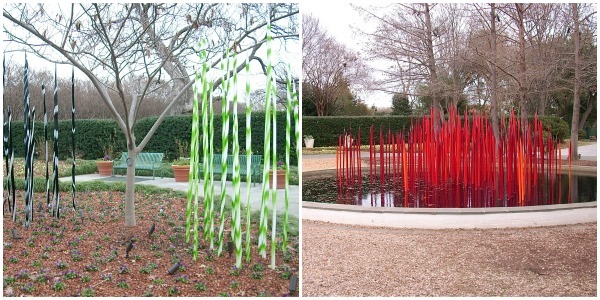 I had never been to the Dallas Arboretum before, and upon seeing it, I don’t know why we waited so long to go. Even though it was winter, it was still beautiful. I can only imagine how gorgeous it is in the Spring. I think a trip back during Spring is definitely in order. 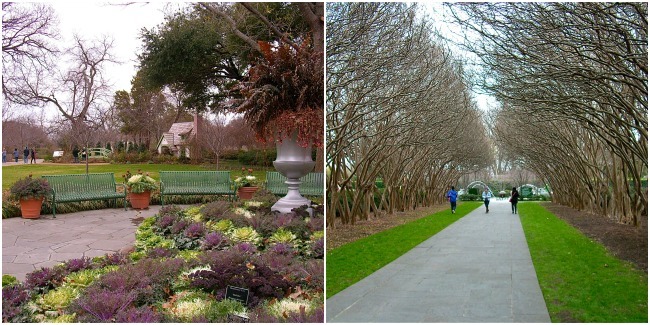 The Dallas Arboretum is situated right along White Rock Lake, which is where I ran my first 15k back in 2011. 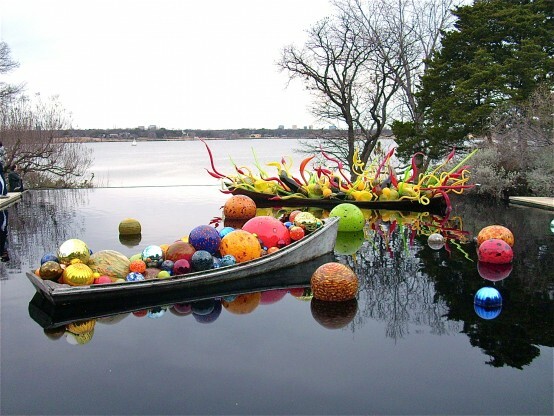 The Arboretum overlooks the lake, and the views are amazing. 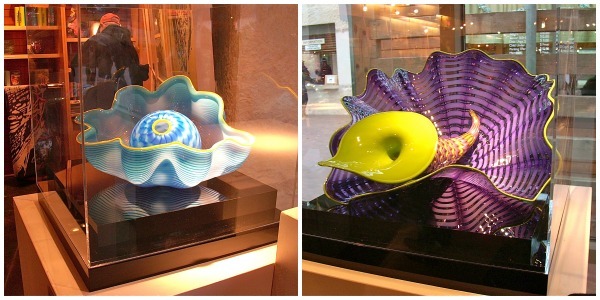 Anyway, on to the glass sculptures. 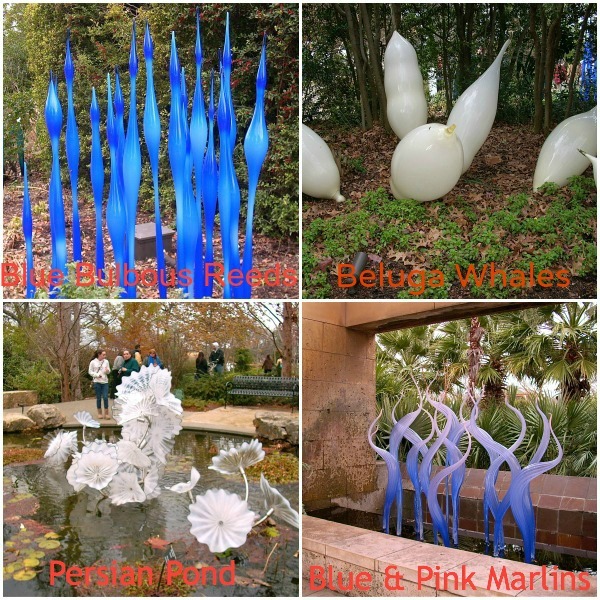 Just outside the entrance, they had what was titled Blue Icicles. The first piece we saw upon entering was the Mexican Hat and Horn Tower. Can you make out the little red “sombreros”? 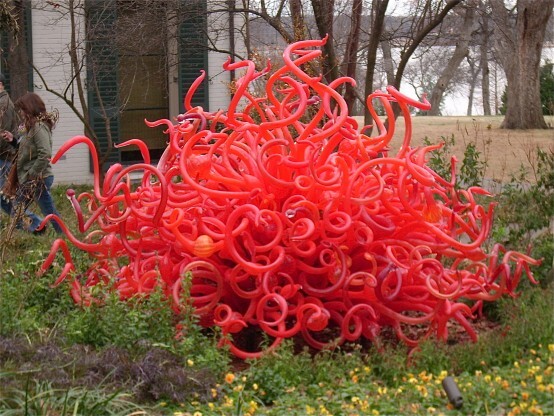 Mexico is one of the countries in which Chihuly blew glass during his Chihuly Over Venice project, and that is where the red forms in this piece were devised. 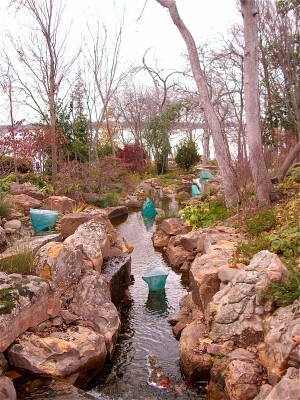 The Arboretum is a fairly large place, and some of the exhibits were spaced pretty far apart. That would be my only complaint. That, and there seemed to be an awful lot of what he calls Reeds. I’m sorry, but they just didn’t wow me. This next one, however, was one of my absolute favorites! 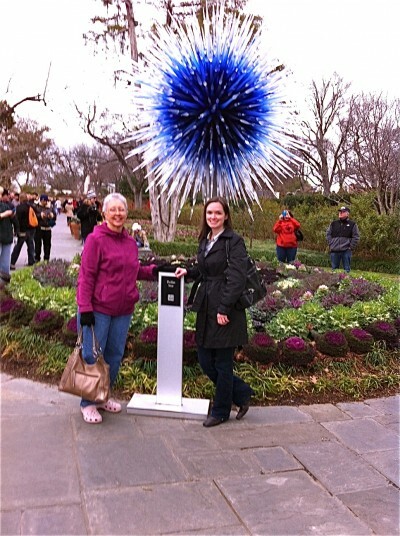 Here’s a shot my husband took on his cell phone of me and my mom in front of the Dallas Star. Next up, we have The Sun. Here’s a little something I didn’t know prior to going to this exhibit. The pieces don’t arrive fully assembled. There are multiple individual pieces that make up the sculptures, and they are assembled on site, one piece at a time. Can you imagine? The Sun alone has over 1300 individual pieces! I’m sure that at night both of the sun pieces would be especially remarkable. This next part of the exhibit was my favorite of all. 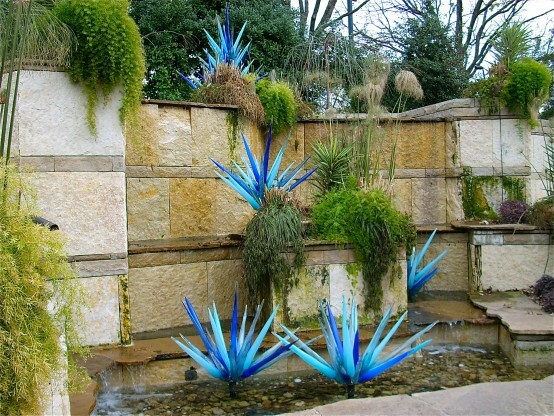 These pieces were situated in the A Woman’s Garden part of the Arboretum. 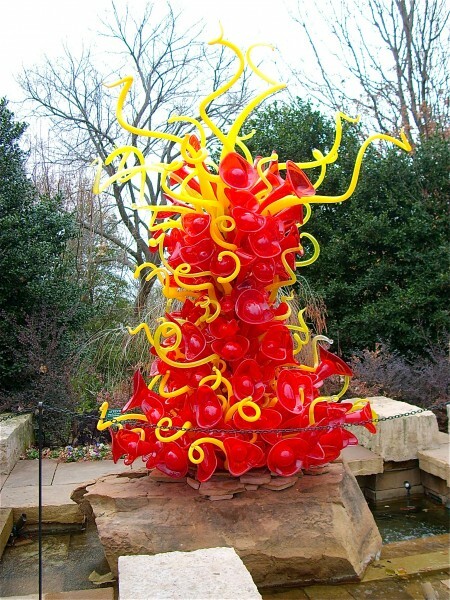 Chihuly coined the term Polyvitro as a name for the material that he used for all of his works that were made of plastic. Before leaving, we stopped by the Arboretum gift shop to look around (and thaw out). I’m so glad that they extended the length of the exhibit. 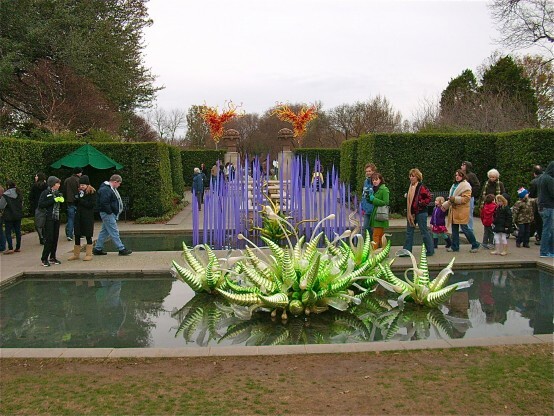 It really was neat to be able to see Chihuly’s work in person. If you ever have the opportunity to see it in person, I strongly urge you to go. It’s worth it, believe me. 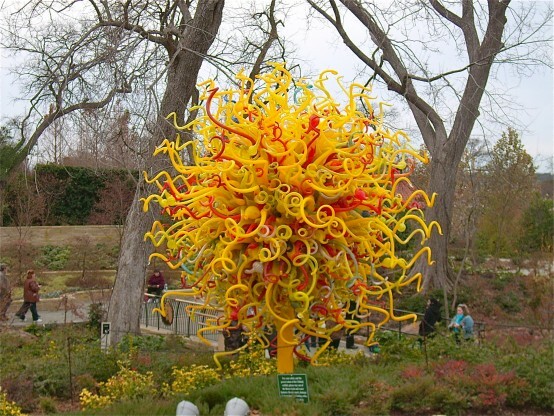 Have you ever seen Chihuly’s work in person? By Tempie at January 4, 2013 . Previous Post: « Happy New Year 2013!